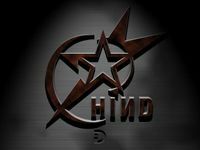 Hind is a computer game released by Digital Integration in 1997 for DOS and Windows 95. The game is a combat flight simulator which features the Soviet Mi-24 Hind attack-helicopter. It came with a detailed and 99 page printed manual. Hind is rated as a PC Gamer editors choice game thanks to its high rating. The game features several game modes. From the main menu the player can choose single missions (playing either alone or in networked multiplayer), a campaign consisting of missions strung together or to undergo training at the Soviet airbase at Saratov. The training is very extensive and teaches the use of weapons and avionics systems, navigation, battle tactics etc. Combat can take place in three locales: Kazakstan, Korea or Afghanistan. The Campaign mode features video clips as well as a detailed briefing before each mission, complete with a mission description, a detailed map and the ability to choose the desired ordnance. It can be linked over IPX and modem networks with Apache Longbow, making it one of the first multiplayer, multisimulator games ever - something Digital Integration has trademarked as 'virtual battlefield'. As with its predecessor, Apache Longbow, Hind features a rather unusual and very realistic cooperative multiplayer mode where two players can occupy the same helicopter, with one piloting the helicopter while the other manages weapons (as Weapons System Officer, or WSO). Not one, but two joysticks are needed to be able to handle the chopper gracefully; a trait which crippled the games sales. Many complex physics effects are modelled, including ground effect, vortex ring, retreating blade stall and autorotation. Options are included to simplify the flight model for beginners [ User edit: and for which 1 joystick is perfectly adequate ]. Some of the missions and campaigns in the game are fictional, but the Afghanistan campaign is based on the 1980s Soviet War in Afghanistan. Ground battles between individual soldiers can be seen taking place, since AI controlled infantry have been added. Soldiers can also be carried aboard the Hind helicopter and are a vital part of some missions. If the player does nothing, an (almost) endless, semi-random and realistic war will be played out in each mission via a combination of scripted scenarios and very basic AI The 'war' can be passively watched using the features for zooming in on and moving about each active unit. Source: Wikipedia, "Hind (computer game)", available under the CC-BY-SA License.